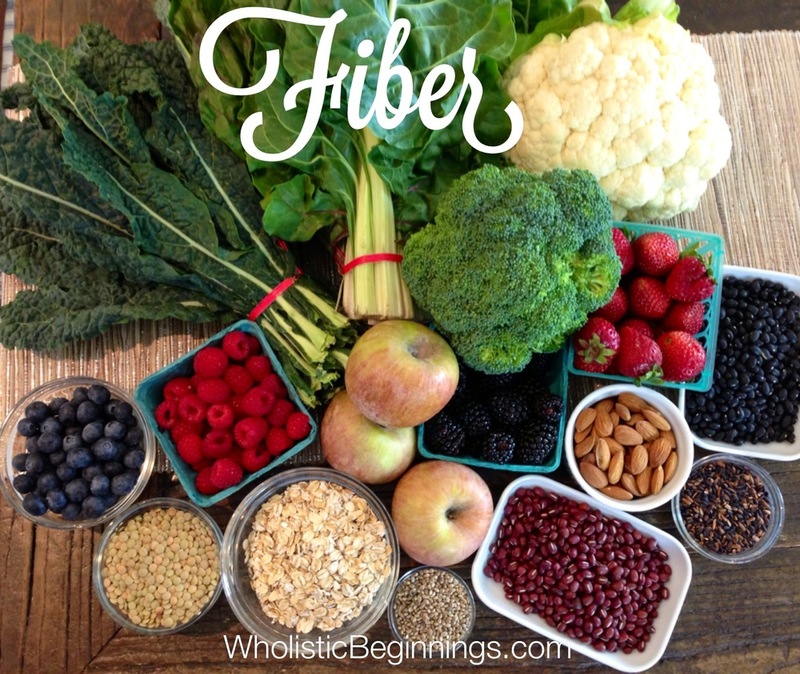 This is what fiber really looks like! Fruits especially ORGANIC berries, apples, avocados and pears. 2 TBSP of avocado has about 2 grams of fiber. A whole avocado has about 10 grams. An organic pear with the skin let on has 5.5 grams of fiber. An apple has about 4.4 grams of fiber. Vegetables like ORGANIC leafy greens, broccoli, cauliflower, peas, artichokes and edamame. A half cup of organic edamame has 11 grams of protein and about 9 grams of fiber! An artichoke has 10.3 grams of fiber and 10 grams of protein. 1 cup of broccoli has 5.1 grams of fiber. Beans of all kinds. White Beans, garbanzo beans, kidney beans and lentils, My favorite at the moment are adzuki beans- I just discovered them! And I am loving black beans too! Black beans contain 15 grams of fiber and protein per cup! 1 cup of cooked lentils have 15.6 grams. 1 cup of frozen peas contain 8.8 grams of fiber. Whole grains like slow cooking oatmeal, brown rice, barley, wild rice, quinoa, etc. 1 cup of brown rice has 3.5 grams of fiber. 1 cup cooked barley has 6.0 grams of fiber. 1 cup cooked oatmeal has 4 grams of fiber. Nuts, like almonds, pistachios, pecans, brazil nuts and walnuts etc. A quarter cup of almonds contains about 3 grams of fiber. Seeds, like hemp seeds, chia seeds, sunflower seeds and flax seeds. Whole foods give your body exactly what it needs, they are nourishing and healing! 1/4 cup of sunflower seeds has 3.9 grams of fiber. Lots of people find relief from constipation when adding leafy green salad, cherries, figs, prunes, pears, aloe juice, warm lemon water, or green vegetable juices to their diet. Fiber needs water to move things along. If you add more fiber to your diet, make sure you drink 2- 3 quarts of water everyday!!! You will feel so much better, I promise!!!! Try drinking a tall glass of warm water with lemon in it first thing in the morning, everyday. Here are some other tips that will help. Getting moving - try walking, doing yoga or even dancing. Just put on your favorite tune and start moving your body. Use Natural Calm - This magnesium citrate supplement works wonders for relaxing the nervous system and increasing bowel movements. Try 2 - 3 tsp in a little water before bed. 2 - 3 tsps. of magnesium citrate is about 320 mgs. If you are having a big issue (emergency only) try 2 - 3 tablespoons before bed. Make sure you stay close to home. PREGNANT? Ask you healthcare provider before using this much magnesium. Disconnect and relax - Stress is a common cause of constipation. When you get home shut off the phone and computer and relax in a warm bath of Epsom salt. Add 2 cups of Epsom salt in bath water, soak for 15 - 20 minutes. Go to bed - Often we become constipated because we haven’t given our body the rest it needs. Go to bed early or take an afternoon nap. Massage your belly - Put some massage oil on your abdomen. Massage your belly starting from the top of your belly moving your hands to the left and down towards your lower abdomen then towards the right side and back up to the top. Follow this circular pattern for several minutes. To make a laxative drink from prunes and bran, soak 4 dried, pitted prunes (or 2 prunes and 2 dried black Mission figs) and 1 tablespoon of bran in 1 cup of warm apple juice for 15 minutes. Eat and drink all of the prunes, bran and juice. This can be done either 1 – 2 times a day. It is best to do it in the morning or at night. Birth Stories - Should You Listen to Them?